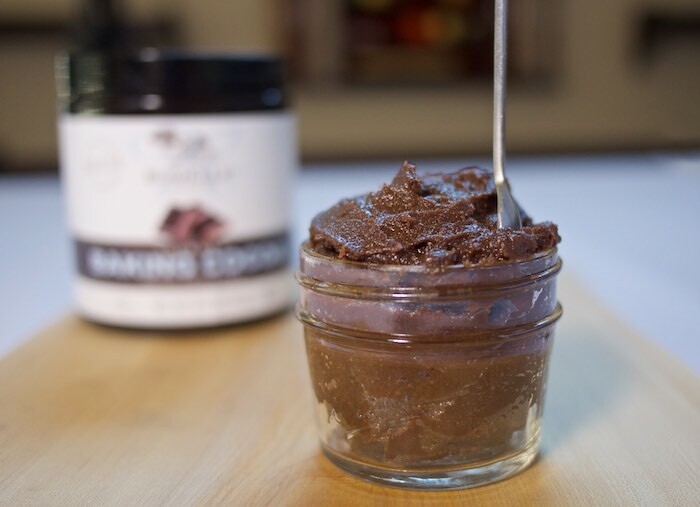 If you love chocolate hazelnut spreads, but don't love all the calories and sugar associated with the store bought brands, you can always make your own. It takes a handful of ingredients and less than an hour to make this healthier version. Without further ado I bring you today's Choctoberfest recipe sponsored by Imperial Sugar & featuring Rodelle baking Cocoa. Don't forget to scroll to the bottom for lots more recipes and a giveaway! Roast hazelnuts for 5-7 minutes at 400 F. Remove from oven and rub them in a paper towel to get the skins off. Blend the nuts in a food processor until they’ve turned to butter. Add the rest of the ingredients and blend until it’s smooth and creamy, this could take a few minutes. When done put in a glass jar to keep fresh. Excited to try your recipe! There are family members who will be very excited too! Thanks Theresa for your creativity! MMMmm yum! Looks so simple to make! Oooh, I'll bet roasting the hazelnuts first makes the flavor SO GOOD! I hit Costco today and had to force myself past the two giant jars of Nutella...even knowing how horrible that stuff is, I still wanted to put it in my cart! LOL! Looks so good, this is on my to do list now. We have many Nutella lovers in our family. I have to say I don't like Nutella that much because it's super sweet. On the other hand making my own would give me the freedom to reduce the amount of sugar but still enjoy this wonderful nutty and creamy treat. I really like all of the simple ingredients! I'd use this homemade recipe a lot more than the store-bought version... It sounds wonderful! I am always looking for healthier, homemade versions. Gotta try this recipe! Honestly, I have never even thought to try making nutella at home but I love it! This looks perfect for our favorite treat - nutella filled crepes! My kids and me are crazy about nutella.I love your recipe because, its better when its home made. I will give it a try.